Bring fun for the whole family with our brand new cotton candy machine. Thiscandy floss machine take sugar as main material, it can produce more colors'and a variety of tastes cotton candy when you add some special flavors. Itworks continually, comes with ON-OFF switch, voltage monitor, voltage device,fuse and drawer. 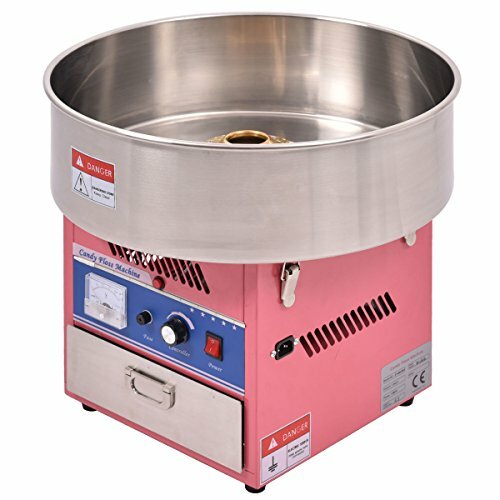 Featuring the Rapid heating plate, it can product the freshand delicious cotton candy for your family, friends or guests in just a fewminutes. The last but not least, this cotton candy machine with music and smalllantern function Not only reduces the noise, but also adds a carnivalatmosphere. Don't hesitate to take it home! Product Size: 20.5" x 20.5" x 17.1"
Colorful Light Design-- This Giantex cotton candy machine has colorful light design, which could give you unique and happy using feeling when you used it. Easy to Use-- This item has straight forward illustrations and descriptions are included. And only two bottoms to control and heat and power. It's very easy to operate and use. Create & Enjoyable - It takes only minutes to get sugar sweets spinning and ready to enjoy. Easily create cotton candy cones, hard candies and sugar floss, which is suitable for party and normal family gathering.